The traditional PC market is shifting. You've only got to look at the huge growth in Android devices to see that. The huge rise in ARM-powered computing devices has certainly been a shock to the system for processor giant Intel and even more so for its traditional x86 competitor AMD. Kevin Lensing, AMD's head of mobility, was fairly honest in his assessment of the market at a recent AMD event attended by TechRadar. "Going back to 2000, you could look at the chart and point to 15% growth in the marketplace [every year]. It was always there and we put new products in the market that were better every year," he says. AMD's success story "levelled off" in 2010 and then, as Lensing says, "we really started to decline. There was a lot of head-scratching." Predictably, he blames tablets for the decline rather than AMD's own issues, such as performance problems and Intel's giant share of the laptop market. "It's not particularly difficult to understand when you [factor in] iOS and Android. The tablet space really has taken over the innovation pipeline. "That 15% growth is still there, but it's [about other devices] now. So the question is what the PC ecosystem is going to do about it. I think there's an opportunity and AMD is in a unique position to change this direction." Lensing says that the old ecosystem was about big screens, x86 performance and getting things done while newer, tablet-based ecosystems are focused on smaller screens and interactivity. The new way is about experiences and how things look and feel. And communication, once a small facet of what a PC can do, is at the heart of most devices now. Lensing feels that AMD - along with the traditional PC industry as a whole - needs to move on, knuckle down and get a share of the market: "We need better screens and software that doesn't slow you down," he says, also making the point that low power tablets can't always provide the performance that people want. Interestingly, Lensing says that tablets have "lost their ability" to innovate in graphics - though it's questionable if tablets ever had that ability in the first place. And then there's compute power. "They're coming up from the bottom [in terms of performance per watt] as Windows devices are coming down the power curve. The interesting thing is they're about to meet in the middle. And that's where the real opportunity is for us." Lensing believes that while the app models are there for iOS and Android, the hardware still has a long way to go to be able to compete with the PC at the top level. And that leaves the door open for power efficient but performance-centric x86 silicon in tablet form factors. While Lensing is keen for AMD move on, it's Dr Lisa Su's job to make it happen. 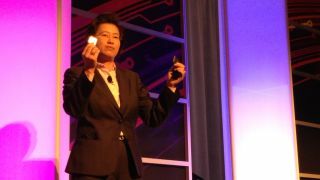 She is head of AMD's global business units and argues convincingly that the organisation is evolving. "We're reshaping the company," she says. "You always knew AMD as a CPU company and that's what we were. But look at how the world is changing, PC market is changing, how the applications are changing, how OEMs are changing. We've really looked at what we want to be in five years." Su says that AMD wants to build on the success of its tailored solutions division - in essence it wants to take advantage of the opportunity presented by consoles, not least its involvement in both the Sony PlayStation 4 and Xbox One. "We really want to be the leading designer and integrator of tailored solutions," she says.